Well, I hope everyone has had a wonderful christmas! I've had a nice little break from stamping and am ready to get back into creating again! I have to say that by the time christmas arrived last year I was so sick of making christmas cards. This year I could have gone on for a long time....I had so many ideas and not enough time. 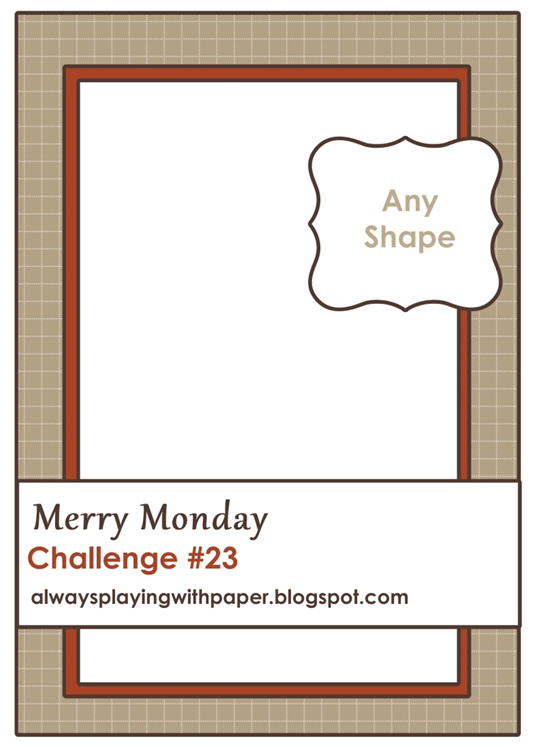 Thank goodness for Merry Monday challenges so I can make christmas cards all year long! This card was a happy accident. I needed to clean off my desk after all that christmas stamping and there were a few things laying there that just happened to coordinate. These were all leftovers from many other projects. This is what I found. When I pulled them together, I thought it would make a striking card, so off to work I went. 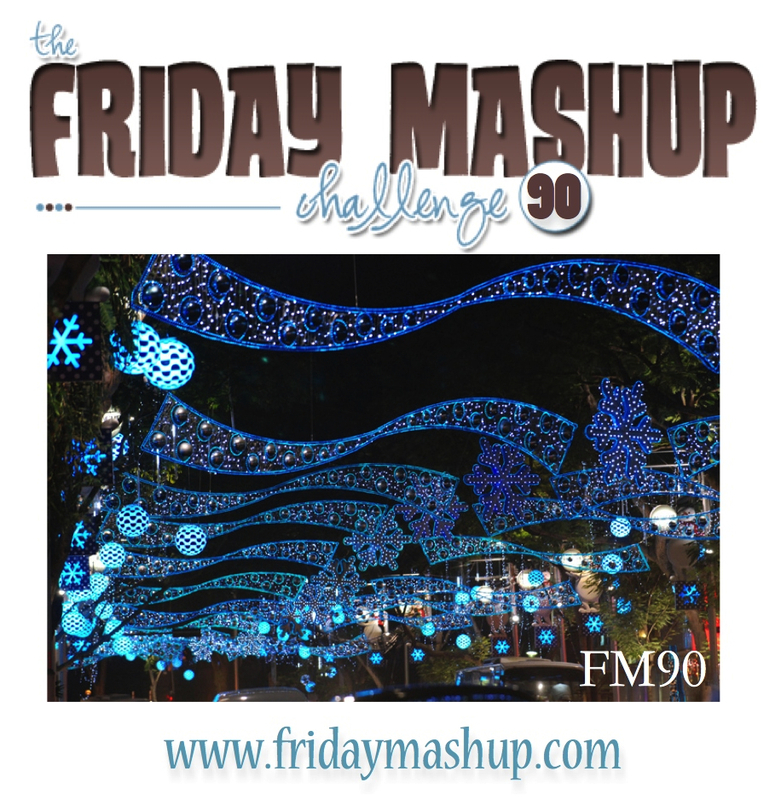 I used the sketch from Freshly Made Sketchs 66 and the snowflake theme from The Friday Mashup 90. 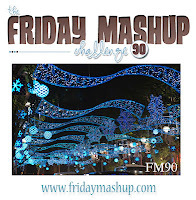 I opted to not use the colors from FM90, obviously. I actually went down to my desk to make a completely different project, but I got so excited about this one, I had to do it first. After I finished I worked on my original card, but it turned out to be a dud, in my opinion. I'm glad this one turned out though! Good Saturday morning everyone! 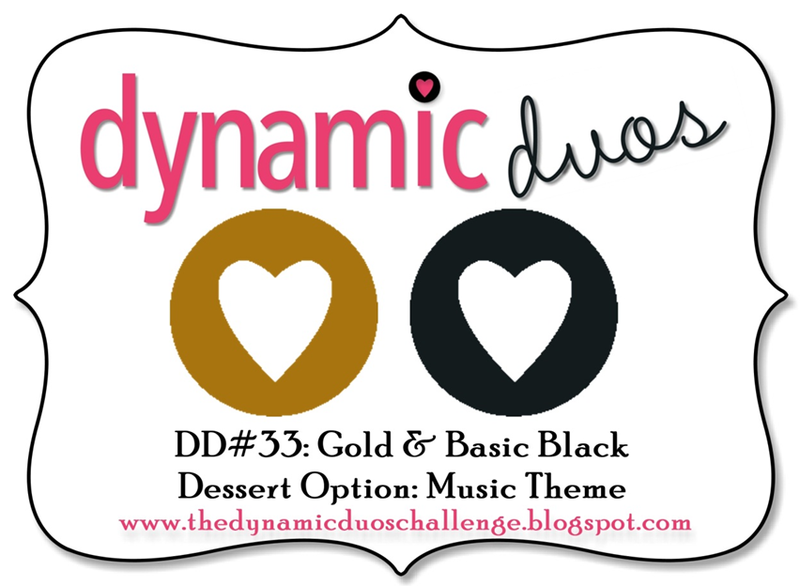 This weeks colors over at Dynamic Duos are Black and Gold with a dessert option of adding music. 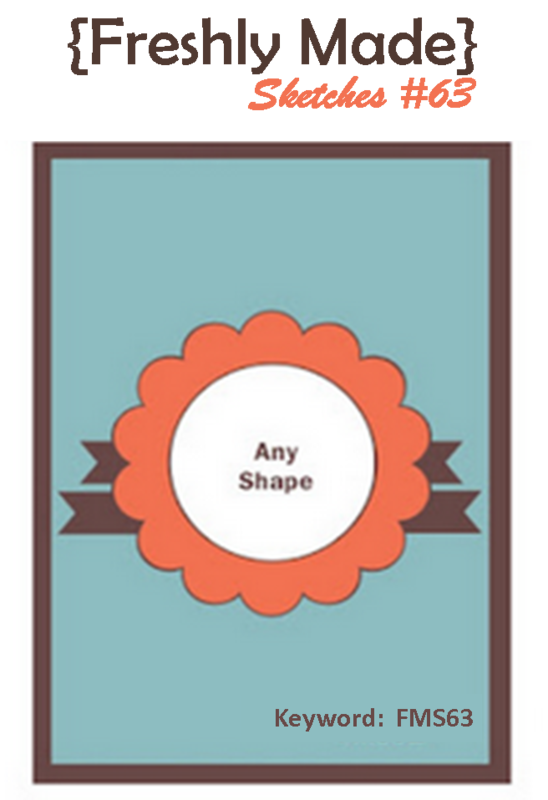 I'm also entering this one in CCMC230, which happens to feature the colors of my card! I'm loving this Champagne Glimmer paper. I was so happy to see when SU added a gold color to their glimmers. I'm a fan of anything that sparkles! Although I've made plenty of cards that don't have any sparkle to them, it seems like I'm not happy with it until some glitter has been added. As I look at the sample from the other design team members at Dynamic Duos, I find the ones I'm truely attracted to have sparkle! Also, this card qualifies for Just Add Ink 148: Just add christmas! The main inspiration for my card comes from a card that I spotted last year made by Lorri. I couldn't wait to try one for myself, and when this challenge came up, I thought it might be the perfect time to put it together. I'm so pleased with the way this turned out! I loved pulling together all the fun little elements for each package on the sleigh! For the sleigh, I started by running a piece of Champagne Shimmer through the Big Shot using my Top Note die. I cut the top part off to make the sleigh. I used a couple of little swirls from the Swirly Decorative Strip die to make the legs of the sleigh. Next, I cut out different sized boxes in different colors and decorated them up. 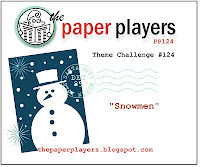 I had to include the music note paper to encompass the music theme from the DD33 challenge. The whole thing went together pretty fast, actually and is far easier to make than it looks. I can't tell you how in love with this card I am! It's been sitting out as part of my christmas decor since it was created, so I can admire it everytime I walk by! 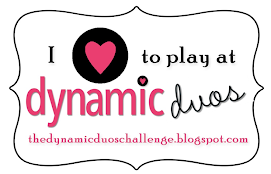 Make sure to stop by Dynamic Duos and check out what the other designers have created....there is much inspiration there! 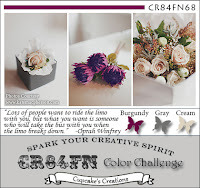 Just a really quick post today to show this card that I made for Sweet Sunday Sketch Challenge 173 and CR84FN 68. I used The Sounding Joy as my centerpiece and added some texture in the form of Fancy Fans and Square Lattice EFs. I sponged gray over the vanilla panel to add softness. Some gray satin ribbon and a vintage faceted button with silver cord complete this pretty christmas card. 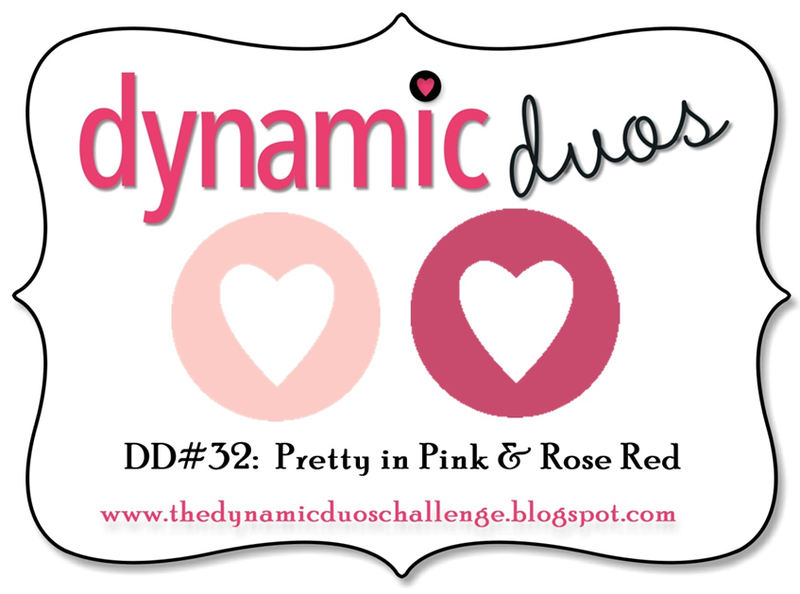 Good morning everyone and welcome to another Dynamic Duos color challenge! It's a monochromatic theme of Pretty in Pink and Rose Red. I also chose to use a sketch from Merry Monday's Year in Review Challenge, where you can pick any past sketch. I chose #23. From the moment I saw this Watercolor Winter set in the Holiday Catalog, I knew I HAD to have it! I've had so much fun playing with the different images. I have yet to stamp these flowers in red though! I seem to gravitate towards non-traditional colors when it comes to these flowers....weird. That will be my next task. Stamp these poinsiettas in red. But for now, I like them in pink! I fussy cut three and layered them on a bed of Crumb Cake evergreen sprigs, included with the set. I added some glitter glue to the center of each flower to add some sparkle. Be sure to check out what the other designers over at Dynamic Duos have done! Here is my entry for Sweet Sunday Sketch Challenge 173. I'm always attracted to the sketches over there, and the challenges last for two weeks. Somehow, time always seems to get away from me, so it's hit and miss when I get to participate. There are already alot of fun cards in the gallery, so there's tons of inspiration....check it out! I'm in the process of creating a variety of christmas cards for a lady who placed an order and this is one that she is getting. I love the color scheme of this, which was unplanned at first. I started with the Soft Suede base card and knew I wanted to combine it with the houndstooth printed paper. I had a scrap of Pink Pirouette laying on my desk, so I decided to see how that would work. I'm in love with the color combo with the gold/champagne mixed in. The ornament is from the Stocking Accents die, and I stamped the words from The Sounding Joy star onto it. I outlined the ornament with some two-way glue and added the gold glitter. I topped it off with a neutral button and accented the corner of the main panel with a layered snowflake, which is my favorite thing about this card! Thanks for taking a peek and have a beautiful day! 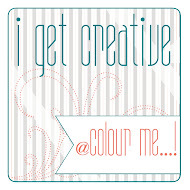 Today's card is for Color Throwdown #221 & Merry Monday Year In Review Challenge. For the MM challenge, I chose past sketch #13. My red and green are a smidge different from the challenge colors, as I used Cherry Cobbler and Garden Green. 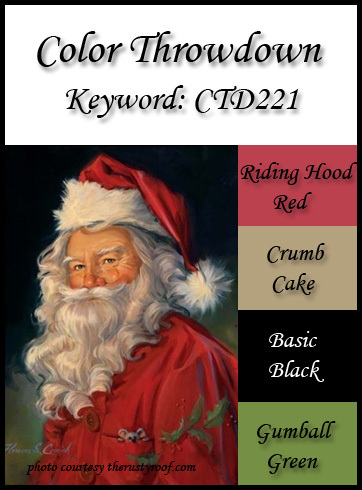 I love the addition of Black and Crumb Cake with red and green! It's so rich looking! My Crumb Cake was added by inking the Lacy Brocade EF and running the paper through the Big Shot. I love the elevated distressed look this gives! I also sponged Crumb Cake right onto the fussy cut tree. I havn't had time to blog much this week, but I have a few projects coming up in the next few days. This card is for Create With Connie and Mary Challenge 228, Nacho Average Challenge 23, and The Paper Players Challenge 124. 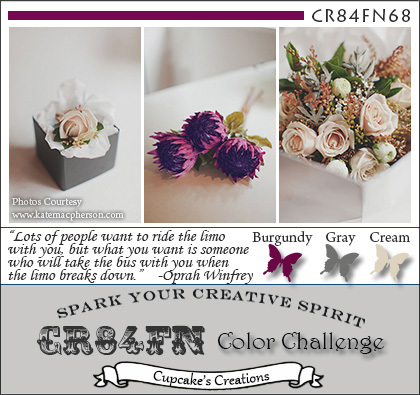 The color challenge for CCMC has always been a favorite of mine for winter cards. I love lavender and light blue for snowflakes and snow. My chistmas cards a few years ago featured these two colors. I used the sketch from Nacho Average Challenge and the snowman theme from The Paper Players. This is the first ink this stamp set has seen. I just got it during the big sale SU had! I love a good deal, and this set WAS a good deal! If you havn't played along at Nacho Average Challenge, you should. 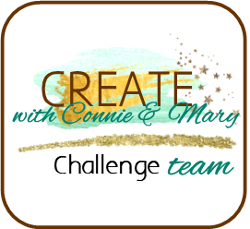 The sketch this week would be the perfect time to try it out! I used alot of glitter glue on this project...almost as a third color! I added it to the top hat, the buttons, accents on the snowman himself, the bird wings, and below his feet as snow. I love all the sparkle this card has to offer, especially with the glimmer paper. It's an eyecatcher for sure! 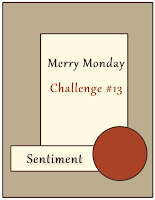 The last thing I did was add the sentiment as a little hanging tag and a layered snowflake accessory using all three colors from the challenge. Thanks for taking a peek and have a terrific day! Today marks the 4th week I have been a designer over at Dynamic Duos. Wow, time really flies! It seems like I was just chosen the other day. 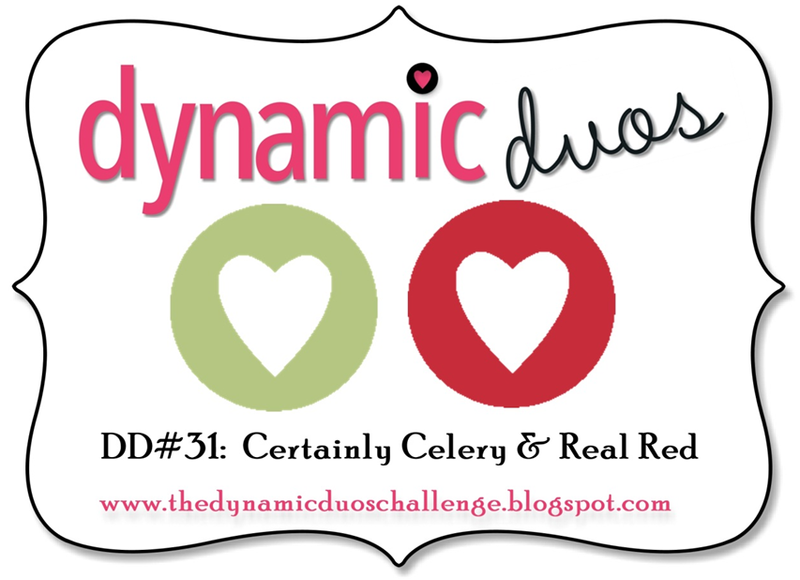 This weeks challenge is to use Real Red and Certainly Celery. 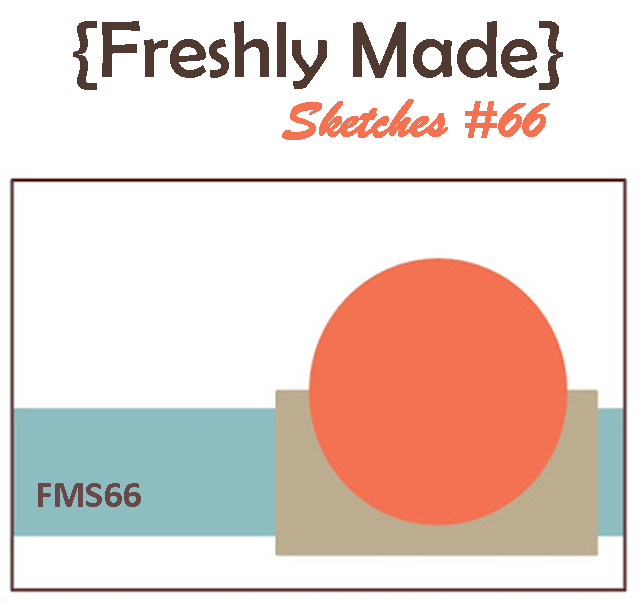 My sketch inspiration this week comes from Freshly Made Sketches #63. Certainly Celery used to be my very favorite green to play with in my cards, but since Pear Pizzaz arrived on the scene, it has taken over first place. It was fun to dig out the older color and use it again! I wanted to play around with the bleaching technique, so I embossed the holly in white on Crumb Cake CS, bleached out the image and used my blender pen to put the Certainly Celery and Real Red onto the leaves and holly berries. What a fun technique. The addition of Crumb Cake, along with the corduroy button, gingham DP, and the linen thread, gives the whole thing a country chistmas kind of feel. Check out the other Dynamic Duos Designers!